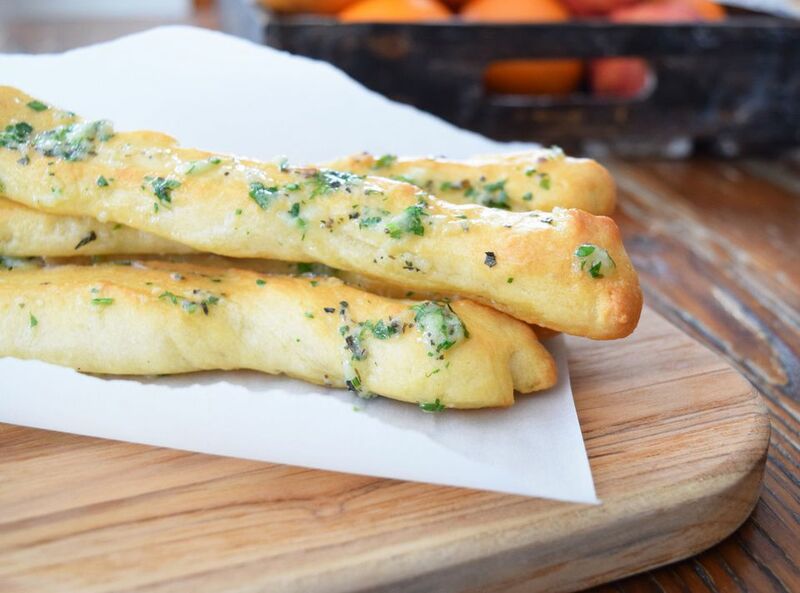 Is there anything better than buttery, garlic breadsticks? Especially when they come out of the oven hot, covered with herbs and a healthy heap of garlic? We think not! These breadsticks rival any Italian food chain breadstick (we may be biased), are just as delicious, and will definitely be gone before you serve your next course. They are crazy addictive and should really come with a warning label, to be honest. So, consider yourself warned. The best part about this recipe? You can make these breadsticks super quick if you use pre-made pizza dough. If you have a little more time, you can go homemade and use the pizza dough recipe below - it makes a great recipe for bread, pizza, and calzones as well! Either option you choose, these breadsticks are sure to please everyone at your dinner table. You may even need to make a double batch! If you are making the homemade pizza dough recipe, follow the below instructions. If you are using pre-made dough, please feel free to jump down to the "Breadstick" section. Add the yeast, salt, sugar and oil to the lukewarm water in a large bowl,-preferably the bowl of a stand mixer-mix gently. Using the dough hook attachment, add in the flour gradually until the dough is no longer sticky and pulls away from the sides of the bowl. Continue to knead the mixture with the dough hook for about 3-5 minutes. If the dough is too sticky, add more flour, about 1/4 cup at a time. Drizzle the dough, and the sides of the bowl, with more olive oil. Cover the bowl with a fresh cloth and let rise for 1 hour in a warm place. Roll out the pizza dough on a piece of oiled parchment paper with an oiled rolling pin, into a thick rectangle. The dough should be about 3/4-inch to 1-inch thick, and make roughly a 8 x 11-inch rectangle. Cut the dough into strips using a pizza dough cutter, or flour scraper. You should be able to cut about 10 (1-inch wide) strips. Place the strips on an oiled baking sheet. You can also line the baking sheet with parchment paper. Brush the strips with olive oil. Bake in the oven for 20 minutes, or until golden brown and fluffy. Whisk together the melted butter, chopped parsley, basil, garlic, salt and garlic powder in a small bowl. While bread sticks are still warm, brush with the mixture on top of each breadstick and serve. Homemade garlicky flatbread - outstanding!